There are high-profile recruits, and then there are high-profile recruits. 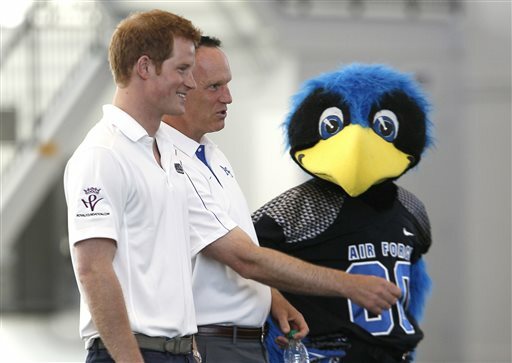 Prince Harry, who is visiting Colorado Springs, Colo., to attend the annual Warrior Games competition for wounded service members, swung by the Air Force Academy on Sunday and took in a football demonstration. That’s American football, not the kind he’s used to playing in a suit, or the kind he’s apparently mastered in video-game form. Air Force head coach Troy Calhoun did the teaching, according to this (Colorado Springs) Gazette report, after receiving a special waiver from the NCAA allowing him to pal around with the prince in an official capacity. Falcons team members weren’t allowed to participate because of similar NCAA rules, per the Gazette, which meant intramural athletes handled the demonstrations. The prince reportedly caught a pass that went 40 yards in the air while on the run and threw one from 30 yards. Air Force was 118th out of 120 Football Bowl Subdivision teams in passing last year; best not to rule anything out. The Air Force cheerleading squad also got to meet the prince, per the Gazette, with him joining the base of a pyramid formation that featured cheerleaders in the middle and “The Bird,” Air Force’s mascot, at the top. See some more pics at the Air Force Academy’s Facebook page here. Follow The Bird on Twitter here. Some more from the Warrior Games from our good friends at Scoop Deck here.